Ligaments connect bone to bone. They provide essential support to a given joint. Conceptually they are the duct tape which provide for a strong foundation. If the ligament is torn, stretched or injured it can become loose thereby compromising the support of a joint. An unstable joint can be painful. Treatment options at the Centeno-Schultz Clinic for instability include x-ray or ultrasound guided prolotherapy, PRP or one or more of the Regenexx family therapies. CR is 21y/o patient with ankle pain following a high-speed rear-end motor vehicle injury. At time of impact he has his right foot on the brake. Conservative therapy in the form of NSAIDs, physical therapy and massage failed to improve the debilitating ankle pain. On physical exam the ankle was noted to be loose. After three prolotherapy injections into the lateral ankle igaments as well as the intersosseus ligaments he reports 90% improvement. If left untreated unstable joints often undergo an acceleration of the degenerative process due to uneven and tear. The International Cellular Medicine Society (ICMS) has become the premier society for cellular medicine representing physicians from 35 countries and 6 continents. It recently held its second annual conference. In addition to presentations on platelet rich plasma(PRP), adipose and bone marrow derived mesenchymal stem cell therapies, the conference also held a one day training course: Essential Knowledge in the Collection of Stem Cells. The Centeno-Schultz Clinic was proud to have three physicians present at this conference. Dr. Centeno was the moderator and lectured on FDA regulation of stem cells and presented new knee outcome data (recently submitted for publication). He also presented on the science and techniques used to collect stem cells from bone marrow. Dr. Schultz lectured on treating degenerative discs with stem cells and on the use of fluoroscopy in stem cell collection. Dr. Hanson lectured on stem cell collection using musculoskeletal ultrasound. Knee arthroscopy and trimming of the meniscus are intended to reduce pain and increase function. Unfortunately this is not always the case. 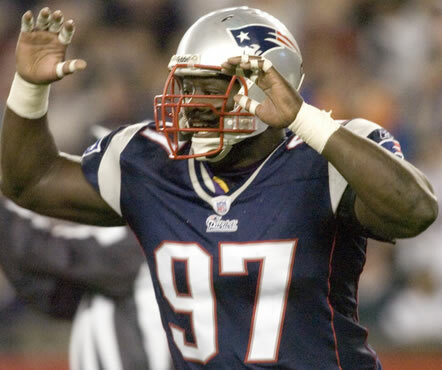 Jarvis Green a two-time super bowl champion failed surgery therapy for his knee pain. Rather than undergo an additional surgery he elected to undergo the Regenexx procedure which enabled him to use his own mesenchymal stem cells. At the Centeno-Schultz Clinic we examine factors which were responsible for the initial injury. 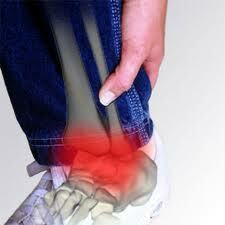 Loose ligaments are tightened with prolotherapy and platelet concentrates. Irritation of lumbar nerves roots which led to weakness in the knee and leg are treated with x-ray guided epidural injections with platelet derived growth factors. Four months after stem cell injections, Jarvis notes a 70% improvement. A post injection MRI of the knee was significant for an increase in the amount of knee cartilage behind the knee cap (patella) as reported by the radiologist. Professional athletes are recognizing stem cell therapy as a viable non-surgical option. At the Centeno-Schultz Clinic we are commited to identifying the source of a patient’s pain. Lateral epidondyitlits is a common source of elbow pain which often can be treated successsfully with IMS and ultrasound guided PRP therapy. When therapies fail to provide signficant and sustained relief, alternative explanations are sought. BS is an athletic professional with severe bilateral elbow pain which had been unresponsive to conservative therapy. PT, trial of NSAID, splints and injection with corticosteroids failed to provide significant relief. She was referred for ultrasound guided PRP injections which provided modest improvement. Upon followup, we performed a comprehensive evaluation and noted numbness in her fingers, neck pain and recreation of elbow pain with rotation of her neck. BS”s MRI of the cervical spine was significant for disc bulges at several levels which narrows the central canal and compressed nerves. She underwent x-ray guided cervical epidural injection completely relieved her elbow symptoms clearly identifying her neck as a major source of her debilitaing elbow pain. BS’s MRI and a normal MRI are shown below. They are side views (Sagital). On the right is a normal MRI with the cervical discs outlined by red circles. The spinal cord is the thick, dark structure that runs from the top of the image to the bottom and is bathed by white cerebral spinal fluid.(CSF). 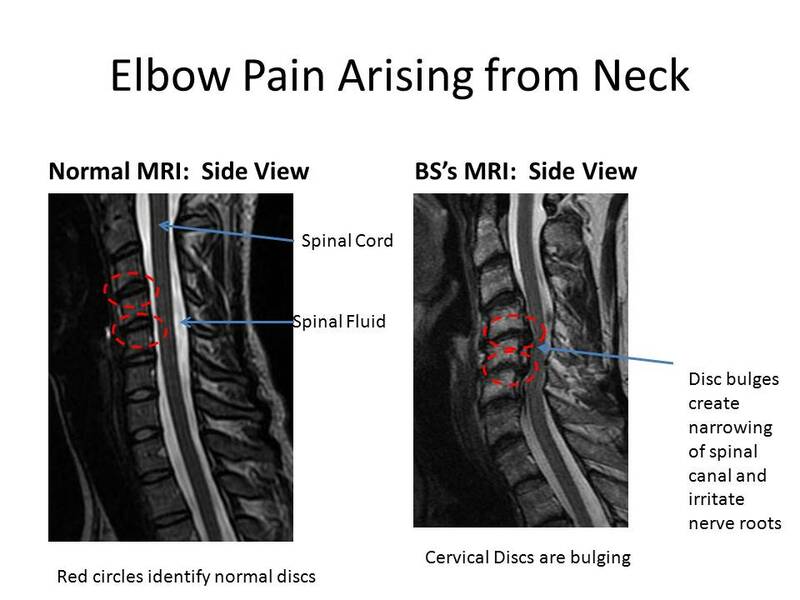 BS’s MRI on the right is significant for several disc protrusion which narrows the cervical canal and irritates the exiting nerve roots. After 12 weeks in a walking boot with extreme pain in the ball of her foot, the surgeon informed AK that major surgery was necessary where he would make a wide incision extending across the base of her foot and remove any abnormal bones and tissue. She declined and sought non-surgical options at the Centeno-Schultz Clinic. AK is a school teacher who was involved in a serious car accident. At time of impact she had her right foot on the brake which was severely damaged. 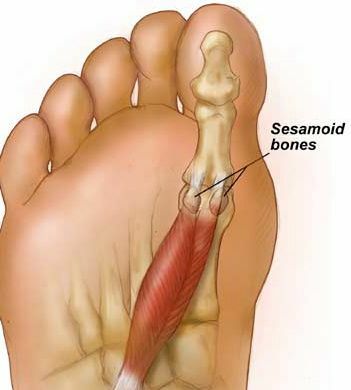 She had immediate onset foot pain which was initially thought to arise for fracture of two small bones in the foot (sesamoid bones). 12 weeks of conservative therapy failed to improve her foot pain. Initial evaluation at the Centeno-Schultz Clinic was significant for tenderness along the SI joint, pain along the flexor ligaments in the foot,laxity of the ankle and foot ligaments and multiple trigger points. AK underwent the prolotherapy of the ankle and tib-fib ligaments, myofascial deactivation (IMS) in the calf and foot, ultrasound guided PRP injections into foot and treatment of her sacroiliac joint and supporting ligaments. The problem was not a fracture in the seasmoid bone but rather injury to the ligaments and muscle in the foot, ankle and pelvis. Dysfunction in these structures led to referred pain. Yesterday in clinic AK reported 90% improvement in her foot pain and was able to avoid a large surgery. She is out of her walking foot and back in the classroom. Discectomy is the surgical removal of a portion of the disc that is thought to be causing pain. 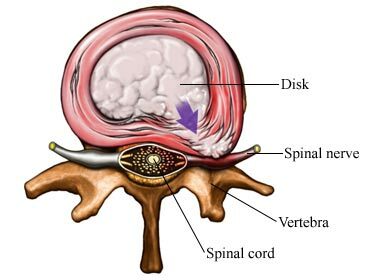 The disc may have a bulge (distention) which presses on a nerve root causing leg pain(sciatica). Removal of the disc bulge is intended to relieve pain. How successful is lumbar discectomy? Not particularly. Loupasis examined long-term outcomes after lumbar discectomy. The long-term results of standard lumbar discectomy are not very satisfying. More than one-third of the patients had unsatisfactory results and more than one-quarter complained of significant residual pain. 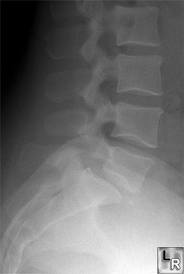 7.3 % of patients required additional lumbar spine surgery frequently due to repeat herniation. A predisposing factor to poor surgical outcomes was a job requiring significant physical activity. Surgery weakens the annulus (side wall of the disc) predisposing the disc to re-injury and herniation as illustrated in this video. At the Centeno-Schultz Clinic x-ray guided injections of PRP, platelet derived growth factors and mesenchymal stem cells are non-surgical options for debilitating lower back and leg pain. All too often degenerative changes on x-ray or MRI are identified as the source of pain. At the Centeno-Schultz Clinic we acknowledge that pain can arise from many sources and that abnormalities on x-ray or MRI do not localize the source of pain. There are patients with abnormal radiographic studies who have no pain and patients who have normal studies with debilitating pain. Therapy based on radiographic abnormalities alone does not make sense. The authors conclude: “a recommendation to operate on trapeziometacarpal (wrist) arthritis based upon radiographic criteria when the patient has adapted well to their illness would be questionable.” This makes particular sense given that arthritis is an inevitable part of aging. After a complete evaluation potential pain generators are identified through ultrasound or x-ray guided diagnostic injections. Therapies at the Centeno-Schultz Clinic include platelet rich plasma, low dose cortisone, prolotherapy and autologous stem cell injections.